Apricots are small, golden orange colored fruits belonging to the Rosaceae family of fruit trees which also include peaches, plums, and nectarine. These fruits are generally available during the summer, though dried and canned apricots are available all the year around. Apricot has a velvety skin and flesh. They are not too juicy but have a smooth and sweet flavor which is slightly musky with a faint tartness somewhat similar to plums. There are several varieties of apricots out of which one or two are available in your local supermarket or fruit stand. These small fruits are very versatile and can be enjoyed both fresh and dried though fresh ones have higher vitamin C content. Dried apricots are more long lasting and are generally preferred by dieters as a snack. Moreover, they are more nutritious than their fresh counterparts. Apart from being consumed as they are, these fruits are a delicacy that can be used in a number of ways and recipes. Apricots have an excellent balance of nutrients which gives us boosts in healthy calories whilst keeping the bad stuff to a minimum. They are very low in cholesterol, saturated fat and sodium, and are a very good source of potassium, vitamin C, vitamin A and dietary fibre. One apricot (of approximately 35g) contains 17 calories, most of which come from the sugars in the fruit. The seed of the apricot contains Vitamin B-17 which is a useful ingredient against cancer, but it should not be used in big quantities because it contains amygdalin. Helps with Constipation – Apricots are rich in fiber and are therefore good for smooth bowel movements. It is often recommended to patients who regularly suffer from constipation due to its laxative properties. Fiber is a way to bulk up the stool. In this way, it becomes easier to transport through the bowels to its eventual excretion from the body. Fiber stimulates the gastric and digestive juices that help absorb the nutrients and break down the food for easier processing. Furthermore, fiber also activates the peristaltic motion of the digestive tract, and those smooth muscles movements are what keep your bowel movements regulated. Bone Health – Apricots have either significant or moderate amounts of all the minerals necessary for healthy bone growth. Calcium, phosphorous, manganese, iron, and copper all play a certain role in the creation of bone matter. Therefore, eating apricots can ensure the healthy growth and development of your bones, as well as preventing various age-related conditions, including osteoporosis. Heart Health – Apricots are a wonderful way to protect your heart from a wide variety of diseases, including atherosclerosis, heart attacks, and strokes. The high amount of vitamin C, as well as potassium and dietary fiber, all contribute to good cardiovascular health. Vitamin C protects the heart from free radicals, potassium lowers blood pressure by relaxing the tension of blood vessels and arteries, while dietary fiber scrapes the excess cholesterol from the lining of the vessels and arteries, thereby clearing them and reducing the strain on the heart. All together, these properties of apricots make it ideal for boosting heart health. Aids with Earaches – Apricot oil is good for earaches, although the exact mechanism is still being studied. Dripping a few drops into the affected ear canal should prove to be a fast remedy. Scientists assume it has something to do with the antioxidant materials that apricot essential oil contains. Fevers – Apricot juice is often given to patients suffering from fever because it provides necessary vitamins, minerals, calories and water to the body, while also detoxifying various systems and organs. Some people also use steamed apricot to relieve fevers. In this way, apricot is a soothing, anti-inflammatory substance that can also impact the body’s overall temperature level when you aren’t sick. Furthermore, it can reduce inflammation in other parts of the body, like for people who suffer from arthritis or gout. Skin Disorders – Apricot oil is good for skin care. It is quickly absorbed by the skin and does not keep the skin oily after it is applied. Apricots are not just useful for maintaining the smooth and shiny appearance of the skin; it also aids in treating a number of skin diseases including eczema, itching, scabies, and a number of other irritating conditions. This is specifically due to the antioxidant compounds found within apricots. 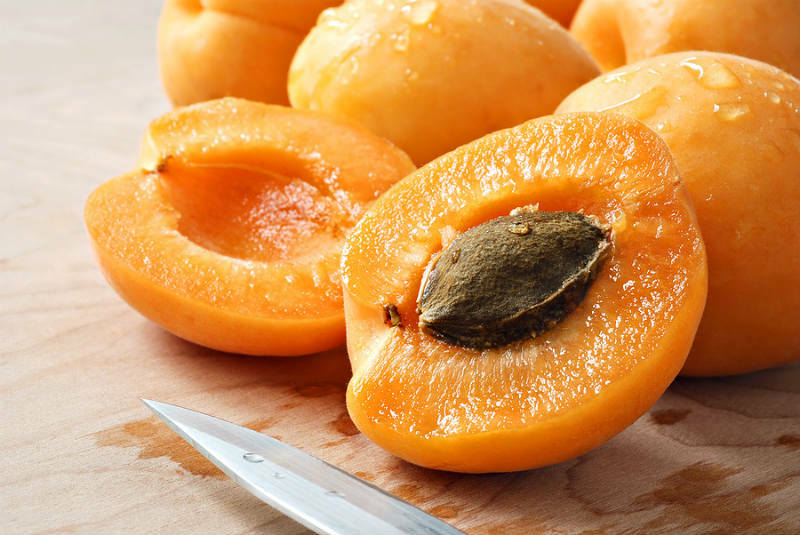 Not only does it have a healthy amount of vitamin A (60% of your daily requirement per serving), which has long been associated with healthier skin, but the antioxidants in apricots protect the skin from the effects of free radicals, which can lead to skin deterioration and signs of premature aging. Treatment of Anemia – Apricot is a rich source of iron that plays an important role in the formation of blood, thus improving blood flow and energy flow. Deficiency of iron can cause anemia. Besides, apricot also contains small amounts of copper that enables the body to absorb iron. Thus, prolonged consumption of apricots helps in the production of hemoglobin which is very useful, particularly for women with heavy flow. Anti-cancer Treatment – The seeds of apricot are believed to aid in the treatment of cancer. Between the carotenoids and the other antioxidant compounds that apricots have, it is no surprise that they are a threat to free radicals. Free radicals are the dangerous byproducts of cellular metabolism that can cause healthy cells to mutate their DNA into cancerous cells. Antioxidants neutralize these harmful compounds and ensure that the body doesn’t contract conditions like cancer, heart disease, Alzheimer’s disease, and aging skin. Apricots have been directly linked to reducing the risk of cancer. Maintains Electrolyte Balance – Apricots contain minerals like potassium and sodium which are vital for maintaining the balance of electrolyte levels. This is important for transportation of ions to every cells of the body. It also maintains fluid level which is important for muscle contraction. Thus, potassium and sodium help in maintaining electrolyte level. Helps with Asthma – It is also believed that apricot oil is anti-asthmatic in nature and helps in treating the disease and its related symptoms. It has certain expectorant and stimulant qualities due to its essential oils. One of these can help to relieve pressure and stress on the lungs and respiratory system, thereby preventing asthma attacks before they begin. Dry apricot contains six times more sugar and calories than fresh. Therefore it is not recommended to be consumed by diabetics and people who have elevated levels of cholesterol in the blood. Dried apricots also are rich source of iron and calcium. Only a cup of fresh apricots contains 75 kcal. Dried apricots contain 195 kcal in 100 grams. Dried apricots are especially recommended for persons who regularly do sports because they contain large amounts of potassium (1.600 mg in 100 g), which is a very important mineral for normal functioning of the muscles. A portion of 5 dry apricots covers 20% of your daily potassium need; and some of the daily need for iron. Take 4 to 5 dried apricots before exercising.